I just got back from IMEX America 2014, where Planning Pod was honored to be one of the 10 event technology products featured in the 2014 IMEX Event Technology Startup Competition. My experience was a wonderful blur, both because of the pace of the show but also because of all the great new event technology apps and founders I encountered. VeeKast – You may have heard about social media walls at events, and VeeKast is a great provider of this type of event tech. They let you create video walls with split/divided screens for broadcasting all types of media, including videos, pics, social media feeds, sponsor content, event schedules and event polls. Topi – A next-gen type of event technology app that utilizes beacons and geofencing (these two items will get lots more play in the coming years) and integrates these with lots of social-media-esque features and content sharing for a very cool tool for creating new connections at conferences and meetings. Speecheo – Really the best new event tech out there for speakers. It lets you share relevant content with your audience in real time on their smartphones as well as gauge their interest and collect feedback during or after the event. Oh, and your audience doesn’t even need to download an app because this works via a mobile Web browser. Speaker Sponsor – It is what it says … an online portal for connecting professional speakers with sponsors. For example, if you are speaking at an event and they aren’t paying you an appearance fee (a fairly typical scenario), you can list a sponsorship opportunity on Speaker Sponsor to get paid for speaking at that engagement by being sponsored by a company. Great idea. Sli.do – Very cool live polling and Q&A tool for events, meetings, etc. Attendees simply go to Sli.do, enter the meeting code and type in their questions. They can then be moderated and put to your presenters, or the audience can also vote on their favorite questions. Planning Pod – Yes we’re blowing our own horn, but mainly because we were featured as a finalist in the IMEX Technology Startup Competition. Our online event management software pulls together 26+ easy-to-use event planning tools to simplify how event professionals and event venues manage details (like tasks, budgets, itineraries, floorplans, etc.) and collaborate with their peers. It lets event pros manage their details on their computer, tablet or smartphone and saves them time with features like reusable templates (for proposals, budgets, task lists, schedules, etc.) and shared calendars. Moove – Probably one of the more creative apps I saw at IMEX America from a user’s perspective. This platform lets event managers create apps for literally gamifying your event. Lets you create apps for treasure or scavenger hunts, rallies, challenges, team competitions, augmented reality, even virtual presenters (George Clooney, anyone). Plus Daniel Herrero, Albert Roca and their team are from Barcelona, and how can something from Barca not be cool. InitLive – If you’ve ever organized volunteers for an event, then you know what herding cats is like. This handy application keeps you connected to your volunteers with shared schedules and real-time stats and communications tools so everyone is on the same page via a smartphone app. 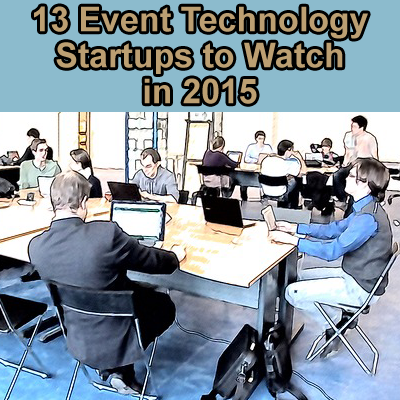 Excellent event tech for non-profit events. I talked with CEO Debbie Pinard and they are looking forward to the launch of this very soon. Eversnap – An interesting new way for collecting and sharing the photos and videos that your guests take at an event. Just have your guests download the app; enter in your event code; and let them share their pics and videos. Everything is uploaded to an online album, and you can even share your guests’ pics in real time at the event on a feed. GruupMeet – Handy Web-based application that simplifies managing the logistics of your attendees and provides relevant live reporting, feedback and attendee notifications. CatchTalk.tv – It’s the YouTube for video content from conferences, meetings and events, but with a great twist. Event speakers can post their own content here and link to it. And conferences themselves can post the prior year’s keynotes and speakers here and collect leads from viewers who have enjoyed the content. Great lead gen tool for conferences and great publicity tool for speakers. And it plugs right into LinkedIn to simplify things. Crowd Mics – An ingenious piece of event technology that turns your attendees’ smartphones into microphones so they can ask their questions and connect to the venue’s sound system. This technology also comes with the ability for your attendees to text their questions/comments and lets you create simple polls to collect data in real time. Attendify – At the 2014 IMEX America show there were more than a dozen event app companies, but Attendify really stood out for me for two reasons. One, as CEO Michael Balyasny explained to me, they are really focused on creating a “private social network” for your event that goes beyond mere content sharing to stimulate and enhance real-life connections. Two, their model is more DIY than others, in that you can set up your event app yourself. This keeps the price tag much lower than other event app providers. All these event technology tools are worth checking out, and hopefully they will save you time and make your event planning go even smoother.